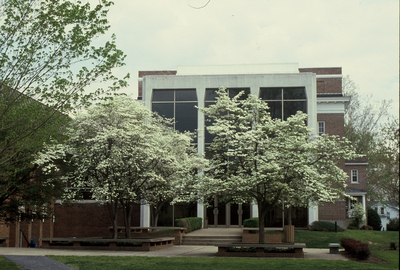 "Flowering dogwoods in front of the Kline Campus Center, mid 1990’s" by L. Michael Hill Ph.D. The state tree of Virginia, the flowering dogwood, Cornus florida (Cornaceae), is well represented on campus. Here are several in flower in front of the Kline Campus Center, mid 1990’s.